A sumptuous banquet feast is to be laid on for a very special big cat. 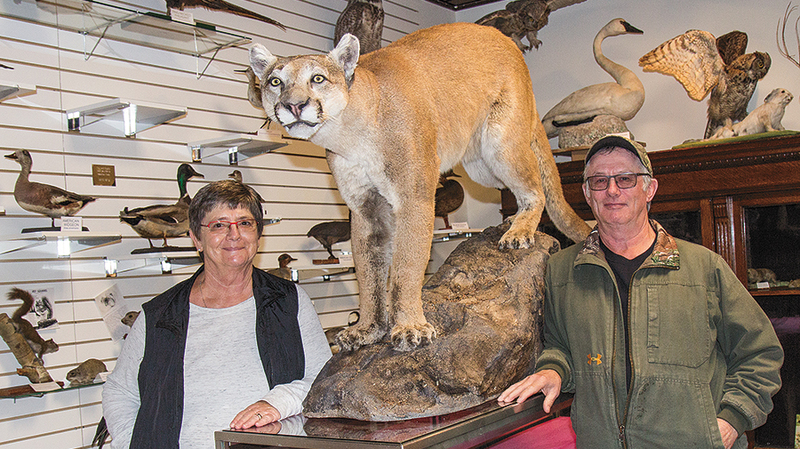 That’s because the local museum, in conjunction with the Killarney Wildlife Association, are celebrating the return of a rare female cougar, now preserved, to the community. The 107-pound cougar was accidently trapped in November of 2014, on John Dietrich’s hobby trap line located southwest of Killarney. And she was so beautiful to behold that a plan was hatched to preserve her for both teaching and education purposes, and for all to admire. The cougar, which has been mounted in the form of a portable unit, is now on its dedicated display table at the museum on Williams Avenue. But she will be making her first trip out into the community next week. A Fundraising Banquet is set for Saturday, April 8, at the Killarney Elks Hall, and will feature a full turkey supper, a silent auction, plus a live auction featuring fresh baked pies, a carved deer’s head, a double tree stand ladder, and a wooden loon. And the cougar, of course. Tickets are available in advance at Lewis and Jones, from museum board members, and from members of the wildlife association, she added. A social hour gets underway at 5 p.m., with the turkey supper laid on at 6 p.m., and followed by the presentation on all things cougar. The next plan is to name the feline. Big cats go by a number of common names, including cougar, panther, catamount, mountain lion, or puma. They are the largest wild cats in North America, and are solitary animals that avoid people, if they can. An adult can weigh up to 200 pounds. A cougar’s primary prey is deer, but they also eat porcupines, raccoons, birds, small mammals, foxes, mice, and grass. They are magnificent, tawny-coated animals, which were previously hunted to near extinction. But cougars are now making a comeback, and have been spotted in Manitoba and in the eastern U.S.A. They are a protected species in Manitoba, and it is illegal to deliberately kill them. Our local cougar, which was accidentally trapped and killed in the autumn of 2015, was found to be a three to three-and-a-half year old female, weighing around 110 pounds, or 49 kilograms. She was reported by scientists who examined her to be in great body condition, with plenty of fat in her abdominal area. This cougar had never had kittens. Inside her stomach were the remains of undigested meat, likely deer, and she did not show evidence of tapeworms or round worms. The average single male cougar needs around 175 square miles of territory for its home range. They prefer wild areas, frequented by deer. One cougar will consume about one deer per week. It will cover the remains of the deer, and return to the kill site to feed, until the meat starts to turn. If you find a cougar kill, don’t hang around the area. The animal may still be nearby. A single male cougar may travel 25 miles a night when hunting. They are most active at dawn and at dusk, when the deer are out feeding. They may be active during the day, in areas far away from humans. Young cougars have spots and a ringed tail, and are sometimes mistaken for bobcats. A cougar has a long tail, while a bobcat has a short tail. Their tracks show four toes on the front foot, and four toes on the back foot. Their retractable claws don’t show up in the prints. The tracks themselves can be over four inches long. The cougar is a good climber, and can leap more than 20 feet up into a tree from a standstill position. They can jump down to the ground from as high as 60 feet up a tree. A litter of one to six kits are born between late winter and mid-summer, and they stay with their mother for one or two years. PRIDE OF PLACE – Joyce and John Dietrich pose with the J.A.V. David Museum’s newest arrival – a rare and elegant preserved cougar. You can meet the female cougar, which was accidentally trapped in the area in 2016, by visiting the museum, and she will also be on view during an upcoming Fundraising Banquet, to be held on Saturday, April 8, at the Killarney Elks Hall.